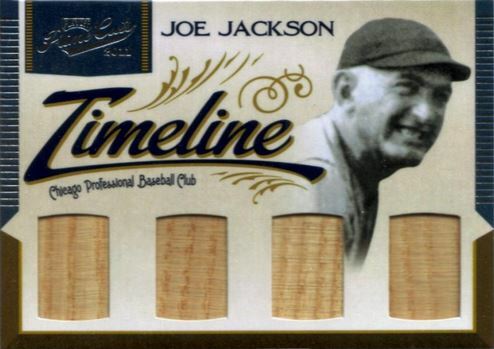 "Shoeless" Joe Jackson baseball cards are some of the most highly coveted in the hobby. Whether it's classic pre-war vintage cards or today's modern hits, for "Shoeless" Joe Jackson collectors, all are worthy of having a place in their personal collections. The fact that Jackson continues to be a hot topic amongst baseball writers, particularly as it relates to whether he should be inducted into the Hall of Fame only adds to his collectibility. 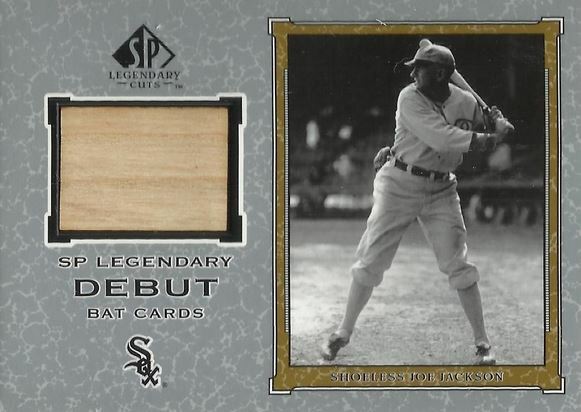 With the introduction of game-used memorabilia and retired-only player products in the late 1990s, it was inevitable that "Shoeless" Joe Jackson be included on the checklist of some these new and developing brands. As the evolution of the modern trading card has continued to progress, new and more captivating designs and uses of vintage game-used memorabilia have been at the forefront. 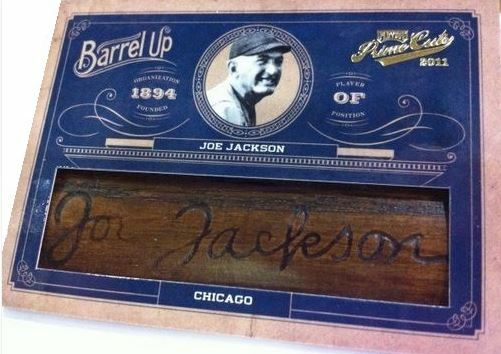 Most collectors will never be able to own a "Shoeless" Joe Jackson game-used bat. That's part of the appeal of his game-used cards. 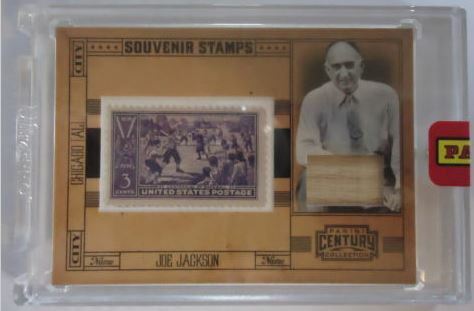 Any collector can now own a small piece, however small, of "Shoeless" Joe Jackson history. To date, there have only been a handful of documented sales of authenticate vintage-era baseball bats used by "Shoeless" Joe Jackson. One was purchased by Upper Deck, circa 1999-2001. Another was purchased by the then Donruss/Playoff company circa 2007-2008. While the amount of money these bats cost the trading card manufacturers has never been made public, recent sales of other bats might provide some insight. In August, 2011, Heritage Auctions sold Jackson's "Black Betsy" bat for a final price price of $537,750. While that figure is certainly nothing to disregard, it would be eclipsed by almost double in February, 2014 when another Jackson bat sold for $956,000. This particular bat was authenticated as having, allegedly, been used during his rookie season. So as you can tell, it's no small accomplishment to include "Shoeless" Joe Jackson memorabilia into today's baseball cards. Here is a look at his best memorabilia cards. This is the card that started it all, at least in terms of being the "Shoeless" Joe Jackson memorabilia card. It features a sizable bat piece and a classic black and white photograph. 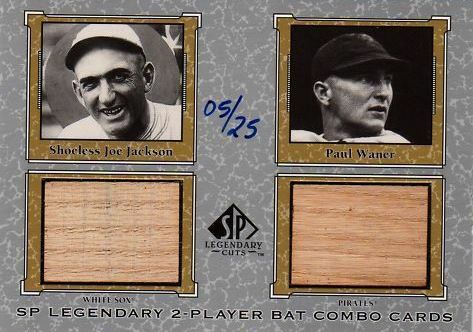 Also issued in 2001 SP Legendary Cuts, this example showcases Joe Jackson with Paul Waner with pieces of game-used bat from each player. The card is hand numbered to 25 copies. 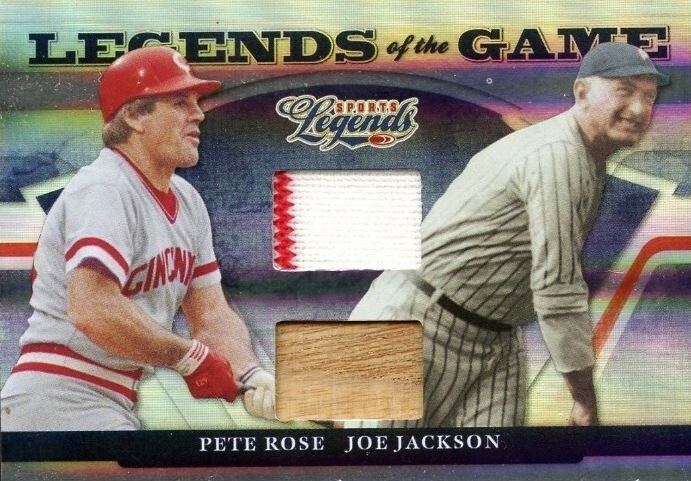 Also featuring Pete Rose, a more fitting title for this particular card would have been "Banned from the Game." This was the first card to ever feature both banned players on a dual-memorabilia card. It is serial numbered to 100 copies. One of the few memorabilia cards of Joe Jackson to be laid out in a vertical orientation, it features one of the best photographs of Joe Jackson ever used on a trading card. The colorized shot shows Jackson smiling. The baseball stitching compliments the overall design. The card is serial numbered to 100 total copies. This unique card combines two different genres of collectibles to create a different type of memorabilia card. It showcases a three-cent US postage stamp that depicts a group of kids playing baseball. Accompanying the stamp is a piece of game-used bat and a black and white picture of Joe Jackson long after his playing days were over. When this card image was released, even mainstream news outlets outside of the hobby took notice. The one-of-one comes with the engraved bat barrel. This impressive card boasts, four pieces of a game-used bat and is numbered to just 5. 2011 Prime Cuts was one of the best received products with Panini's use of their limited MLBPA license. Cards like this were one of the reasons why. 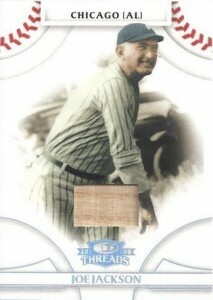 This is easily one of the most attractive "Shoeless" Joe Jackson memorabilia cards. 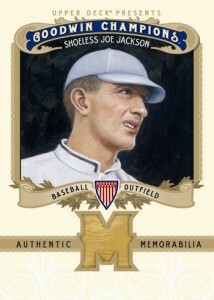 The card design incorporates a ticket from the 1919 World Series in the background, with a large black and white portrait of Jackson in the foreground. 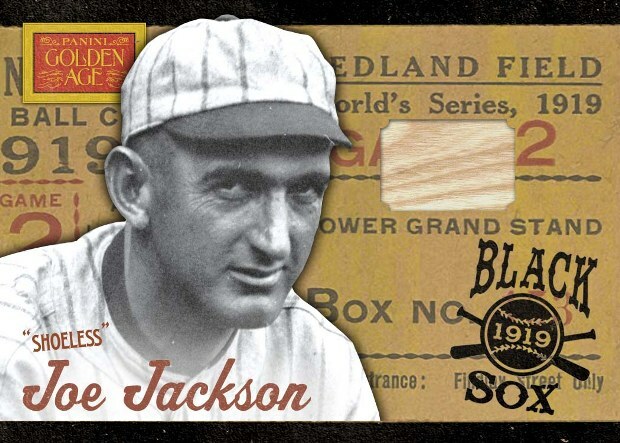 A Black Sox 1919 stamp reminds everyone that despite how great a player he was, Jackson's legacy will, unfortunately, be forever tied to this shameful event. When the image of this card was first released with the early solicitation for the product, it had collectors giddy. 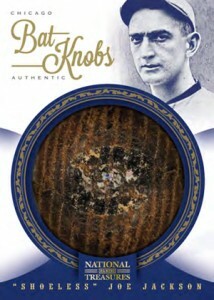 A true one-of-one, to date, it is the only "Shoeless" Joe Jackson game-used bat knob card produced. Eleven years after producing the first "Shoeless" Joe Jackson memorabilia card, Upper Deck released this card in its multi-sport 2012 Goodwin Champions. It features an art rendering of Jackson and a small piece of bat set into a die-cut letter "M."